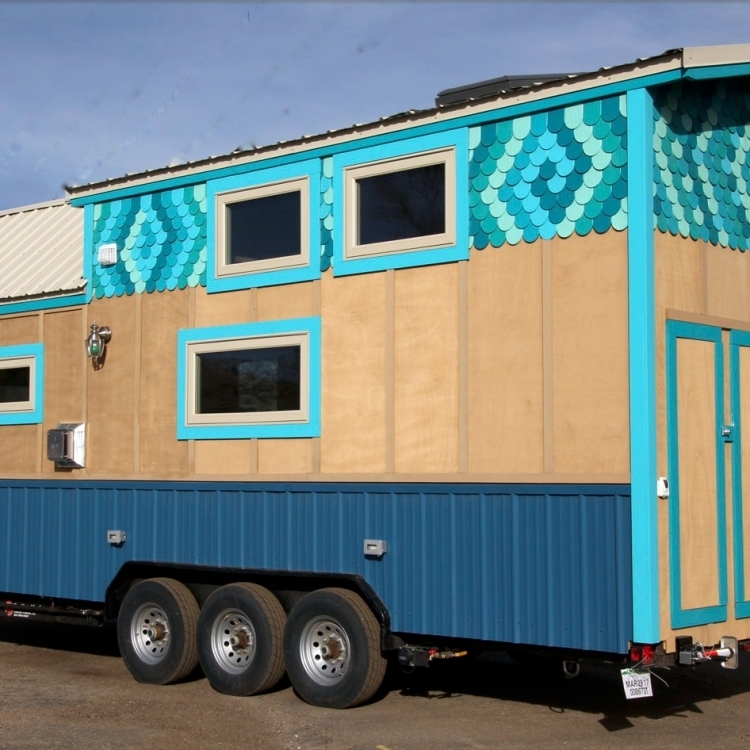 The SimBLISSity 26’ Judy Blue Eyes is one of the “Aspen” model Tiny Homes on Wheels custom designed and built for a delightful, colorful, young woman on her way to California to become a film maker. California daydreaming while sitting in snowy Colorado, the future filmmaker wanted a Tiny with an “ocean theme” to warm her soul and future. Thus, the exterior’s lower sides represent the ocean with its blue metal siding. Immediately above the ocean there is sand-colored “Breckenridge” siding for the beach feeling. Placed above the beach are multi-colored blue sky scalloped shingles creating a magical and whimsical appearance to this captivating Tiny. Stepping inside this Tiny one discovers the ultimate attention to details that SimBLISSity is known for. Immediately eyes are drawn to the Napoleon propane fireplace; this is the source of heat on the chilly eves near the sea. 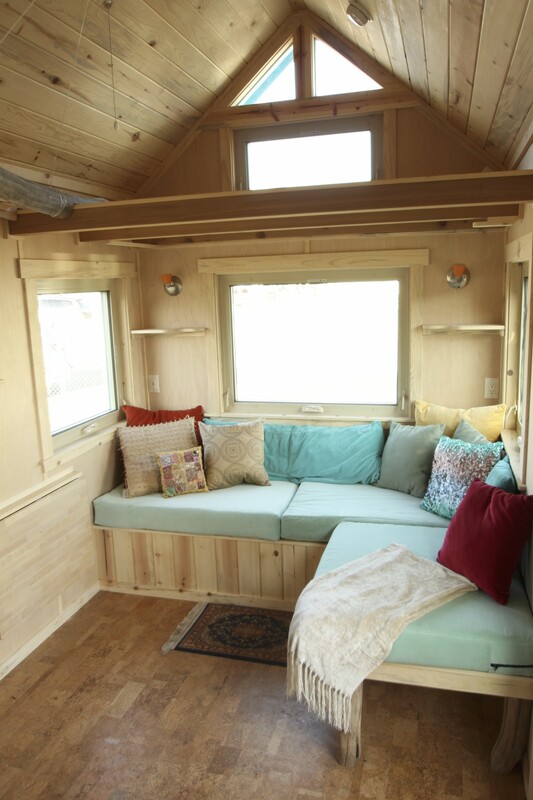 The comfortable L-shaped sofa was designed for enhancing romance while listening to the owner playing her ukele and singing her sultry lullabies. The adjoining large kitchen has a 9’ butcher block counter top, lots of kitchen cabinet storage, a denatured alcohol countertop stove, and Energy Star rated refrigerator with bottom freezer. There is a pantry and closet for clothing. A piece from the Tiny lover’s grandmother’s antique dressing table was converted to a turntable shelf. The spacious bathroom with its full-sized 5’ bathtub carries you to the shore with its ocean and beach-themed tiles. 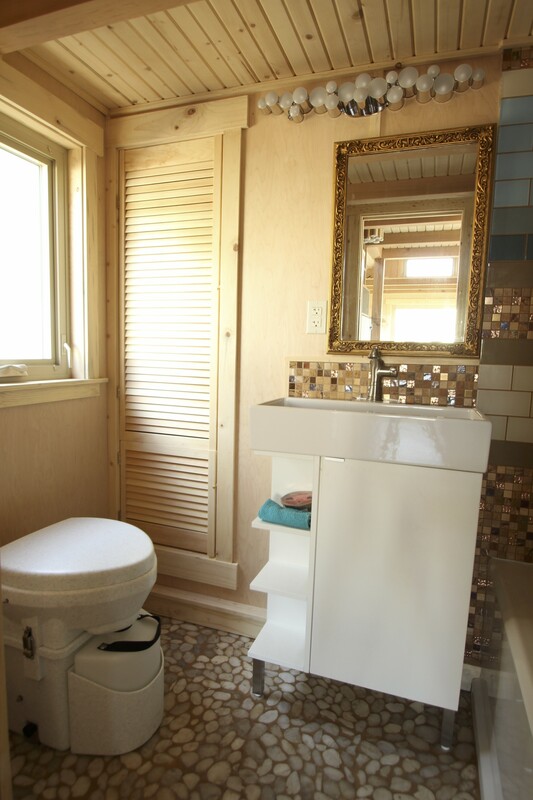 There is a bathroom vanity and a Natures Head composting toilet. The linen closet provides additional closet space as well. 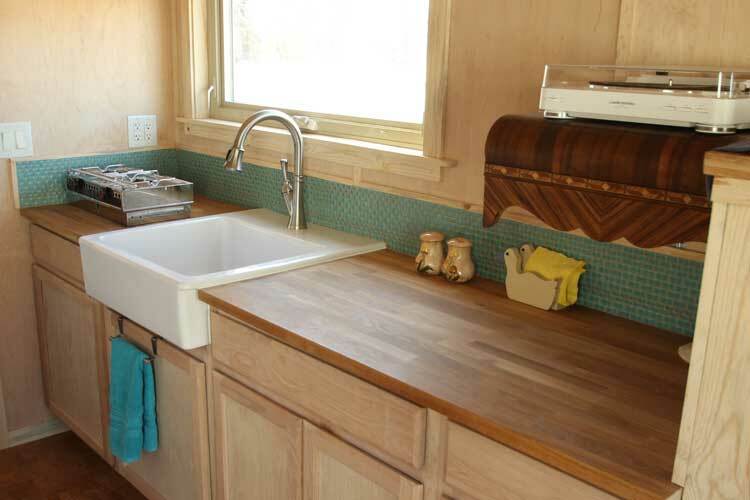 The “on demand“ water heater will fill the tub and provide endless hot showers. Heading up the stairway one reaches the roomy 12’ x 8’ sleeping loft with 4’ of head clearance. The bedside tables are part of the grandmother’s antique dressing table. A queen sized bed fits between providing plenty of room for romantic moments. 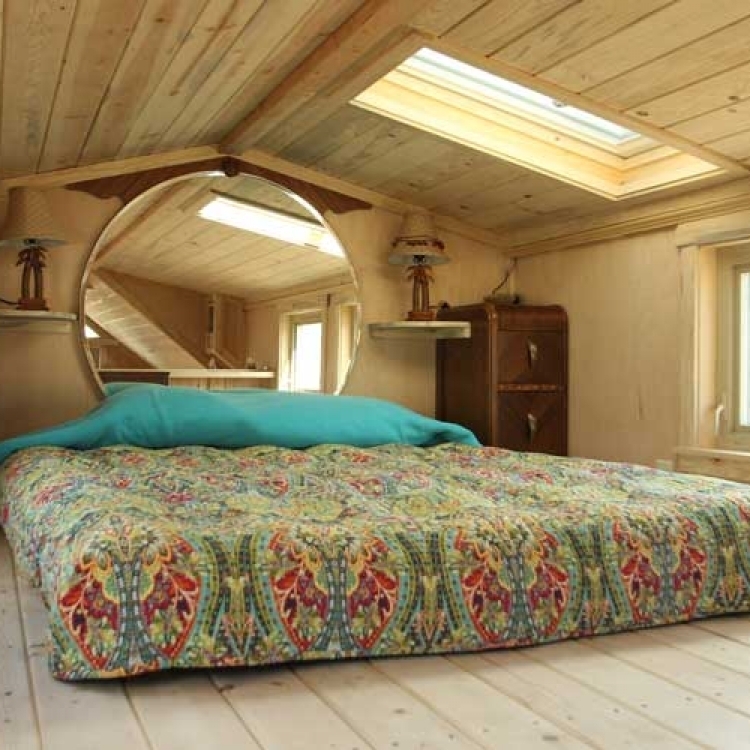 Above the bed is a large operable skylight for sleepless nights of stargazing. Four 24” x 36” awning windows provide lots of light and ample cross-breeze to cool those warm California days. There is a bookshelf and a cabinet to store this music lover’s vinyl record collection. Her cats will enjoy the unique and creatively designed “Cat bridge” that stretches from the sleeping loft to the front loft. 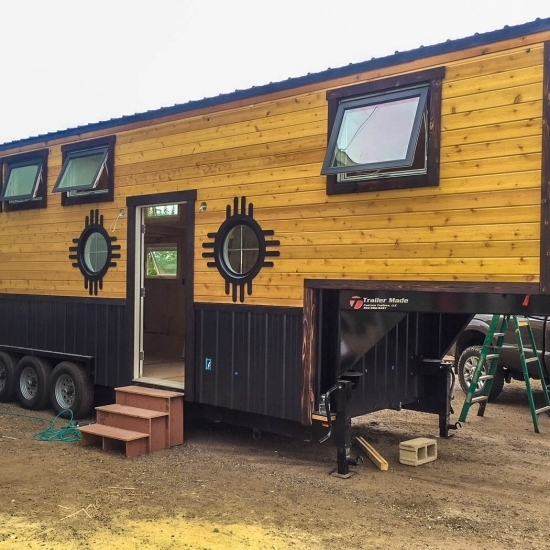 This nearly 300 sq. ft. 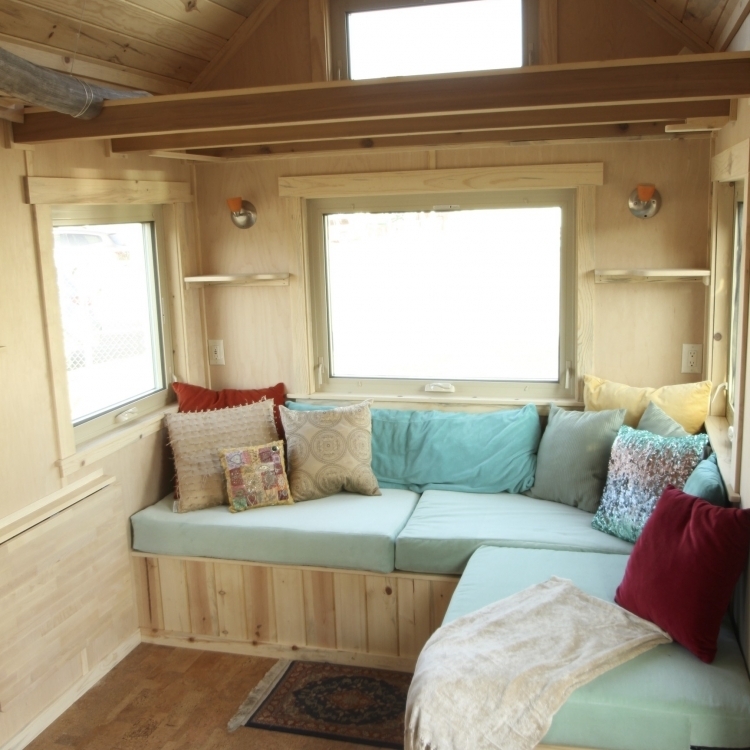 Tiny Home is bright and spacious providing inspiration and comfort. On the rear of the Tiny is a “two bicycle” garage with extra space for all the goodies that help to nurture one’s soul. 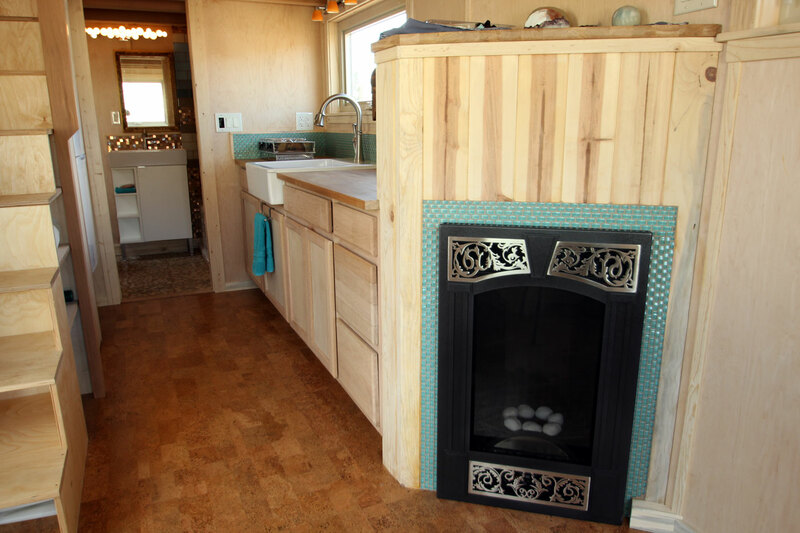 SimBLISSity builds custom Tinys that fit the eccentric nature of their clients. 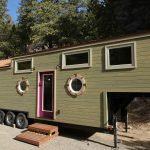 This Tiny Home built upon a 26’ TrailerMade movable foundation with twin 7K axles can be recreated for around $85,000.00.